If you own a duck hunting boat such as a Jon boat, duck-boat, or even a rowboat and hunt ducks or waterfowl around ponds, rivers, streams, lakes and other waterways, it is extremely important for you to have the proper boating education. Hunting and boating deaths and accidents have declined over the last few years, since they instituted both suggested and mandatory education programs. Duck hunters must keep up on non-mandatory boating education efforts and observe the legal rules, so that boating accident statistics continue to improve. Hunting while you are boating adds new dangers and new dimensions. Hunters need to observe both hunting and boating rules and boating techniques, due to the added danger elements of boating and carrying a duck gun together. A boat such as rowboat and Jon or duck-boats often do not have the safety of lateral stability like some other boats. They are easier to broach or swamp, just by weight distribution shifts within the boat. 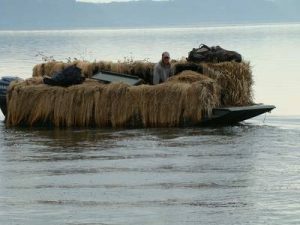 A hunter in a duck hunting boat also endures the dangers of weather changes, which could lead to harsher weather elements. One major threat to both sportsman and hunter is the danger of hypothermia during the fall and winter season, which is when waterfowl and duck hunters are usually out. Another added danger is multiple duck hunters in a small boat. Hunters need to map out their fields of fire and make sure that they maintain them exactly. Factored into this mix, hunters need to understand about movement inside the boat caused by dogs jumping and hunters swinging their rifles or shotguns. Returning home safely with no accidents, after spending your time in a boat shooting at waterfowl, is a perfect way to enjoy this sport. Like any indoor or outdoor sport, you need education and preparation. Both waterfowl hunting and boating, including a boat for duck hunting, needs mandatory boating and hunting education in most places. Many states need people to take a boating safety course before he or she can obtain a boating license and hunter safety course before they issue you a waterfowl license. Hunters with their duck boat license often choose Jon boats for duck hunting. They design this flat-bottomed duck hunting boat, usually made of wood or aluminum, to stand up to the rigors of the weather. Some of the durability features include formed-in, rounded keels, superior cast lifting handles, coined and extruded ribs, and durable, tough paint finishes. They also offer options such as a pedestal seat, dual console, center seat, vinyl heavy-duty floor covering and even digital stereo CD players.